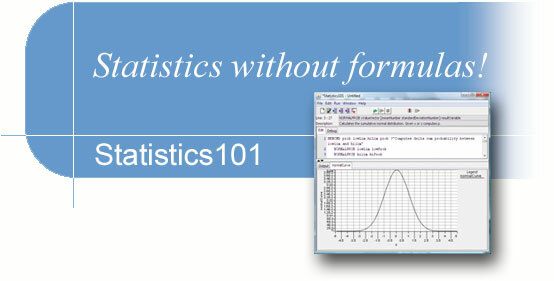 Statistics101: Statistics the easy way! Resampling, Bootstrap, etc. Statistics101 is a giftware computer program that interprets and executes the simple but powerful “Resampling Stats” programming language. The original Resampling Stats language and computer program were developed by Dr. Julian Simon and Peter Bruce as a new way to teach Statistics to social science students. Of course, social science students aren't the only ones who can benefit. Anyone who wants to learn statistics will find that the resampling approach helps in understanding statistical concepts from the simplest to the most difficult. In addition, professionals who want to use resampling, bootstrapping, or Monte Carlo simulations will find Statistics101 helpful. The history, description, and application of the Resampling method to a vast range of statistical problems are described fully in Dr. Simon's book Resampling: The New Statistics. Julian Simon wrote, "... it is necessary to emphasize that the resampling method is used to solve the problems themselves rather than as a demonstration device to teach the notions found in the standard conventional approach. Simulation has been used in elementary courses in the past, but only to demonstrate the operation of the analytical mathematical ideas. That is very different than using the resampling approach to solve statistics problems themselves, as is done here." Learn probability and statistics the easy way—by simulation. Gain deeper understanding of traditional statistics concepts and methods. Increase your awareness of the role of variability in probability and statistics. Learn and apply simple to very sophisticated statistical techniques without tables or complicated formulas. Statistics101 complements your traditional Statistics classes. Although it was originally developed to aid students, the Statistics101 program is suitable for all levels of statistical sophistication. It is especially useful for Monte Carlo, resampling, and bootstrap applications. It has been used by professionals in many fields. These include anthropology, biology, ecology, evolutionary biology, epidemiology, marine biology, psychology, sociology, toxicology, veterinary pathology. Statistics101 is written in Java and will run on Windows, Mac, Unix, Linux, or any other platform that supports Java 1.4 or better.